The additional ground stations should allow an uniterrupted connection when you are on an orbit with 0Ã‚Â° inclination. There is also one additional ground station for launch north from KSC. While the KSC can cover the whole kerbol system if not obstructed, most of the other ground stations have a range of 9Mm, while the even paler support stations (eg the 3 around ksc and one on the other side of kerbin) have a range of 1Mm, so they are only good for low kerbin orbits. edit: It is also a small github experiment for me, in advance of KSP 1.1. 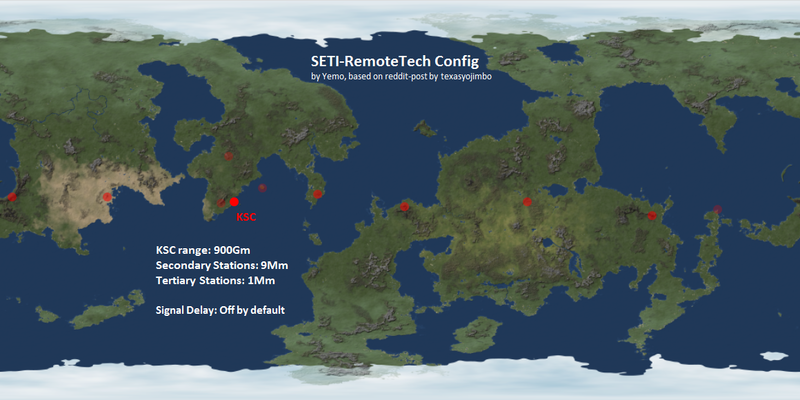 This is a SETI config for RemoteTech, adding ground stations, changing the KSC range to cover the whole kerbol system (when not obstructed), setting signal delay to false and tweaking some colors. Are all the ground stations connected together? Or would you still need to create a satellite network to maintain constant comms? Any ground stations functions like the KSC antenna, so you only need to connect to one of those for control/science transmission. So no need for a comm network as long as you stay in a kerbin orbit with low inclination and close enough for the secondary ranges (9Mm max distance). Imho it makes the start easier and removes some comm clutter objects from LKO/KSO, so you can concentrate on the long distance connections or sat networks around other planets and moons. While the massive KSC range helps with that, you still need something more for uninterrupted connections. IF YOU WANT TO CONTINUE WITH A 1.0.4 SAVE, you now need both SETIctt and SETIrebalance folders! IF YOU WANT TO CONTINUE WITH A SETIctt 1.0.4 SAVE, you now need both SETIctt and SETIrebalance folders! Ok, so I've tested the waters with a few test contracts. Only thing is, I'm not satisfied with the contract pack name, currently SSI Aerospace. I came into it with SETI in mind, and wanted permission to perhaps call it: Contract Pack: SETI - Aircraft Before Unmanned. Is it ok I use the SETI name with it Yemo? The pack is KAX aware and recommended, but not required to work with SETI or stock. so i was excited to see this had been split out from the rebalance mod, as i didn't really want any of the other rebalances, but these changes are a bit beyond "No part rebalances except for early probe cores." I respect your choice to maintain the mod however you want, but wanted to provide this as feedback. Also, my career hasn't been going long, but I didn't see a need for SETIcontracts anymore, except for stuff like recycling station and colonizing, since those features aren't in the stock game. thank you for asking me about it. 2. With the title of this thread including "Unmanned before Manned" and "SETI", a contract pack called "SETI - Aircraft Before Unmanned" would clearly look like something coming from this thread (and this thread would turn up in google). Which is a serious problem from support to feedback. 3. It would also express a preference/affiliation from the "SETI-ModPack" point of view towards your contract pack. Which would also lead to questions like "Do I need SETIctt to use that contract pack? ", since many users do not read the forum threads before asking such questions. With #2, that question would likely be asked in this thread instead of yours. On the other side, people who do not like SETI for whatever reason would stay away from your contract pack (and trust me there are quite a few who are against the very idea of the SETI-BalanceMod). 4. Due to those reasons, I tried to avoid the SETI name myself, for every newer mod which is not strictly SETI related. SETIcontracts and SETIgreenhouse only have that name because they were once a part of the SETI-BalanceMod, same goes for SETIctt. SETI-RemoteTech is just a config which is mainly included in the SETI-BalanceMod download, the separate download is just for modularity. As mentioned before, I try to shrink the "SETI-Pack" down again, using SETIcontracts as a guinea pig before phasing it out and SETIgreenhouse dev has essentially stopped a long time ago. So that I can just focus on SETIctt and SETI-BalanceMod (including the config for RemoteTech and possibly other rebalancing configs in the future). => Thus my newest "real mod" (more than a single compatibility config file for another mod) UnmannedBeforeManned does not mention SETI apart from some background infos. I would therefore recommend using a different name which avoids the problems mentioned above, especially concerning support issues in general and the assumptions associated with something like "SETI" in particular. As I said, I tried to change it myself at some point. a) Aircraft Before Unmanned seemingly implies a tech tree component moving aircraft parts around in the tech tree (like "BetterThanStartingManned" and "UnmannedBeforeManned"). Or it implies that such a tech tree component is needed for the contract pack (like SETIcontracts implies that other SETI mods are needed, although it would work fine with ETT as well, thus the name decreases the playerbase for the mod). b) There is another contract pack dealing with aircraft missions. I can only recommend implementing mechanisms to deal with the situation where both are installed, because people interested in aircraft contracts will do so (I often saw SETIcontracts and AdvancedProgression installed together and if I would not phase out SEITcontracts anyway, I would do something to prevent all those issues). I learned from that with UnmannedBeforeManned, which completely deactivates every component of itself, if some other tech tree mods are detected (via :NEEDS[!<mod>] module manager statements). edit: Not to discourage you, those are just my experiences, especially with the SETI name and mod support issues. In other news, the [COLOR=#b22222][B]CustomBarnKit[/B][/COLOR] has some [COLOR=#b22222][B]issues[/B][/COLOR] at the moment. 2. The latest version has some wrong entries in the default.cfg, disabling action groups in the VAB by default. [quote name='dunadirect']so i was excited to see this had been split out from the rebalance mod, as i didn't really want any of the other rebalances, but these changes are a bit beyond "No part rebalances except for early probe cores." I respect your choice to maintain the mod however you want, but wanted to provide this as feedback. missed your post while writing the other one. The "no part rebalances" was meant as a contrast to the KSP 1.0.4 SETIctt, where part stats were changed, not only their position in the tech tree. With the split of SETIctt, it also does not rebalance parts anymore, that functionality is now outsourced to SETIrebalance (for a transition period the latter is redistributed within the SETI-CommunityTechTree download, to provide consistency for the users continuing their 1.0.4 careers). Imho the changes are complemantary to early unmanned and aircraft construction, expecially since it should also work with mods like remote tech. Fairings are more important with probes, structural fuselages are important for aircraft, launch clamps counteract the lower torque within probe cores when launching, multi-adapters are useful for RemoteTech multi-sat launches and so on. The one thing I still dislike about stock contracts is, that you are not able to cancel them. Also they do not make it benefitial to launch probes first to a planet. I do not intend to really develop the SETIcontracts to an extent that was originally envisioned. But I will use them for testing some stuff. Since CustomBarnKit hast just been updated to 1.1.3, the previous fix works only for the SPH now, so it needs another update. And while on it I also corrected all ladder positions in the tech tree to something more useful for aircraft. I'm wonder why is the water (ocean) bugged as soon as I install some mods. at the moment I'm using KSP 1.0.5 + installed essential SETI mods + few recommended ones. The thing is that all mods seem to work just fine but as soon as I try to splash down into water something game breaking happens. It's either that my pod/capsule bounces on the surface of the ocean until it explodes or it just sinks to the bottom of the ocean and then explodes like there is no water at all. I really can't figure out which mod causes that. Maybe it's a combination of mods, I don't know. This is really the only serious problem I have when I try to play with a few mods to extend the career playtime. Maybe someone got a solution for this. I know only one: to not use any mods. [quote name='BoskoSLO']I'm wonder why is the water (ocean) bugged as soon as I install some mods. at the moment I'm using KSP 1.0.5 + installed essential SETI mods + few recommended ones. Try testing if the cause is FAR. 1.0.5 updated water physics, which IIRC FAR edited somewhat. I'm not sure if FAR has received an update yet or not; but that might be a starting point. I don't understand why I can't run experiments (thermometer, barometer) with my probe. I only can run telemetry report. It has an antenna, power. I use remote tech mod too. And if that does not help, start with a few mods and then expand on it. Also I saw that "wiggle to death in water" bug in a ksptv stream just before launch, with a 100% stock game, so it might not even be the mods. Make sure you have the latest version (I noticed a "hidden update" after KSP 1.0.5 by steam). I am having the same problem, just updated to 1.0.5 and updated the mods. I am also running remote tech. Hm, I just tested with my ckan install and it works fine. Can both of you please provide an exported ckan mod list (the one with mod versions), or if you do not use ckan please provide a screenshot of you gamedata folder (though that provides much less information). Did you "update" your modded 1.0.4 install or did you just do a new install and then reinstalled the mods which are 1.0.5 compatible? The game was update through steam, and i then manually updated the mods. Just did a clean install and reinstal mods and it works fine now. Hm, it would be best to delete everything in you GameData folder except for the SQUAD folder and then install all the mods using ckan (except for the ones which you can not install using ckan). 1. You need to merge the RemoteTech folder which is inside your SETI-RmoteTecch-1.0.0 with the RemoteTech folder of your GameData directory. 2. You need to delete all ModuleManager dlls except the 2.6.13 one. I've noticed some odd errors when trying to use this mod with procedural parts. I think it might be linked with the new PPart textures/configs that are bundled with the rebalance mod. On trying to load the textures, PParts will throw array out of bounds exceptions and no textures end up being loaded (everything is white, and the PPart texture selection menu just reads "**NOT FOUND**". Also, attempting to right click the procedural heat shield freezes the game with a stack overflow exception. Removing the procedural parts directory and procedural textures directories from the SETI rebalancing mod restores normal function. For support, I ll need an exported .ckan list of your installed mods or a screenshot of your gamedata folder if you installed manually. I started a SETI career in 1.0.4, it worked fine (but slowly ^^ ). Now with the update in 1.0.5, I cannot transmit science anymore from my satellites (all my mods are updated). I put a Multispectral Scanner satellite around the Mun, waited for it to scan 100% of the surface, then analysed data. It shows 24 science points, the button "transmit 100%" is there, but when I click on it... nothing happen. At all. I still have the 24 science points in the report, I still can click on the transmit button, but it still do nothing. Of course my satellite has an antenna (Communotron32) AND is linked to the KSC by my other comm sats. There's also the strange behavior of the sats : they spin without of control on themselves and even the RCSs cannot stabilize them (but they worked fine in 1.0.4). Did you "update" your modded 1.0.4 install (which is taunting the kraken) or did you do a new install and then reinstalled the mods which are 1.0.5 compatible (which is how you should do it when there is a KSP update)? I recommend using CKAN for the base of your new install (for the mods which are listed in ckan). It just makes it easier to not miss dependencies/recommendations and so on. You can try porting your old savegame, but not all mods are updated yet (you might have to look for fixes in the threads/reports about how they work in 1.0.5). I do not like where squad is heading in terms of development (feature list and console ports as apparent priorities) and customer treatment. Since forum rule 3.4 forbids me from discussing staff decisions or disrespecting staff (apparently by criticizing in a certain fashion/extent) and those rules are strictly enforced, even in threads which announce the deletion of many hours of user created content, I will not respond to any inquiries regarding the details of my decision. Thank you all for your support of this mod.